those who are handicapped, and those who are wounded by life. Alfred Bessette (1845 – 1937) was born near Montreal, Canada. Although illiterate, he entered the Congregation of Holy Cross in 1870 and was given the name Brother André. His first assignment, which was to last him 40 years, was as the doorman (porter) of the community’s Notre Dame College in Montreal. Brother André developed a deep devotion to St. Joseph, the foster father of Jesus and the patron saint of the Brothers of Holy Cross. As people came to the school, burdened by their own struggles and suffering, Brother André directed them to pray to St. Joseph. When an epidemic broke out at a nearby college, André volunteered to nurse. Not one person died. The trickle of sick people to his door became a flood. His superiors were uneasy; diocesan authorities were suspicious; doctors called him a quack. “I do not cure,” he said again and again. “St. Joseph cures.” In the end he needed four secretaries to handle the 80,000 letters he received each year. Through Brother André’s healing touch, thousands of people were cured and he became known as the “Miracle Man of Montreal.” One of his greatest material contributions during his lifetime was the building of St. Joseph’s Oratory. 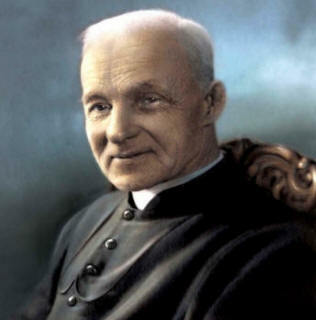 Brother André Bessette’s hope for a substantial shrine to Saint Joseph, located on Mount Royal above the city of Montreal, stimulated large and small donations from many of the people whose lives had been touched by the holy man. The Congregation of Holy Cross already owned the very property that would be suitable. Construction began in 1914. A crypt church seating 1,000 was completed in 1917. By 1931 there were gleaming walls, but money ran out. “Put a statue of St. Joseph in the middle. If he wants a roof over his head, he’ll get it.” The magnificent Oratory on Mount Royal took 50 years to build, and Brother André died in 1937 without seeing that completion. Brother André Bessette, C.S.C. was entombed at the Oratory, and, with his body lying in state, more than a million people climbed the slope of Mount Royal to honor him. Today, the Oratory is a world-famous pilgrimage destination, attracting more than 2 million visitors a year. Those visitors have included Pope John Paul II. It is the world’s largest shrine dedicated to Saint Joseph, the foster father of Jesus. Saint Bessette’s incorrupt body is still at the Oratory of St. Joseph. Recognizing the saintly life of this humble man, Pope John Paul II beatified him in 1982. He was canonized by Pope Benedict XVI, on October 17, 2010. Quotes of Saint Andre: "It is St. Joseph who cures. I am only his little dog." "God chose the most ignorant one. If there was anyone more ignorant than I am, God would have chosen him instead of me." "It is surprising that I am frequently asked for cures, but rarely for humility and the spirit of faith. Yet, they are so important...."
"If the soul is sick, one must begin by treating the soul. Do you have faith? Do you believe that God can do something for you? Go confess yourself to the priest...then go to communion..."
Thanks to the Congregation of Holy Cross for the basis of this narrative.